What’s with all the hats on the dash?? Has anyone noticed this trend of guys putting hats on dash? I’ve seen trucks w/ 4-5 hats up to several going across entire dash. I mean I wear a baseball cap and throw on dash while driving, but it’s 1 cap. Why?What gives?? It’s to protect the dash from the sun. Cheap protection. You need one for every occasion. I'm not going to wear my pig trapping hat to a Broadway show or a baby's christening. Probably all flat bill too huh? I haven't seen that. I ain't gonna follow that trend I do know that. I don't mind a pair of gloves or something on the dash but I don't like a lot of stuff on it. It’s because they don’t have a back window deck to put them in, duh! Tell me you haven’t seen a Lincoln Town Car or a Cadillac with 8 caps in the back window for some reason? Don't forget the box of Kleenex! Don’t know why so many on the dash. When on long trips I do take my hat off and lay it on the dash. When I put it back on the kids no we’re almost there or making a stop. I sometimes wind up with 3 or 4 scattered around the truck, it just happens. 1 for feed-n live stock and go-n to the feed store (can be accompanied by another worn out well used one). 2 or 3 for work pend-n what I was feel-n like that day. 1 for work-n on the truck, car, or motor/mechanical equipment. 1 or 2 nice clean ones for go-n in the grocery store or meet-n your date/wife/girlfriend at a restaurant. At least 2 camo to cover the begining and end of season. Just a few examples. I'm a man of many hats. I've got racks full of-em pend-n what I'm do-n in the next moment, or later. I have one for my sons baseball team, one for my daughters softball team and one camo cap I wear when I’m working, just easier to keep them all handy when I’m literally going from one complex to the next every wknd. To hide their radar detector! Remember seeing them 30 years ago. If it is UV protection I need me some hats. Having a warped dash pad replaced under warranty next week. Three year old black dash in Houston. I figured they were trying to fade them a bit so they don’t look new. That way people mite think they work for a livin and actually pull trailers with that 3/4 ton. To cover up the out of date registration sticker so you can tell the policeman you didn’t realize it was out because of your hats in the way ! Ha ha ha. I have 3 or 4. I'm bald so I wear a hat almost all the time, but only drive with my sunglasses on. Put my hat on the dash.. usually go in the house and leave the hat in the truck. Leave the next day... need a hat so I grab one. Every once in a while I clean my truck out, then the wife complains I have too many hats. I get gimme caps from businesses that I frequent but keep them behind the seat. I put which ever on when I go into that business. That way they see I actually wear it and advertise for them and will give me another one. I didn't realize that this was a new fad, but I did see a big truck the other day and he had at least 15 hats on his dash. I thought "what tha heck is with all the hats?". All different uses for the different hats -- son's various past and current baseball teams, regular camo, orange camo for public land, etc. ; dash keeps them from getting smashed elsewhere. Guess it's okay if a fad catches up to my common sense storage system. I keep 3-6 on the back dash of my car when I get one I throw it back there and it’s easy access. Last edited by Texas8point; 06-14-2018 at 05:20 AM. Must be a Texas thing. Around here the flatbillers are content with driving around with their tow mirrors deployed and stacks in their truck bed. Flat bill hats- stupid lookin' and shouldn't even b allowed in pro baseball. It's an open forum, I ain't asking for nor do I need any comments. My cap rides shotgun. But that’s only because it’ll wind up in the passenger floorboard if I don’t. . I do keep a boonie stuffed in the corner of my dash for easy deployment though. I've got 3 or 4 on my dash. If I still had a gun rack in the back window I guess I could hang them there. I don't see the big deal about ball caps on the truck dash. I'm bald and wear one every time I'm out. I know someone that has done this. You don't just throw a hat up there. It needs to be a bright hat to draw their attention away from the registration. 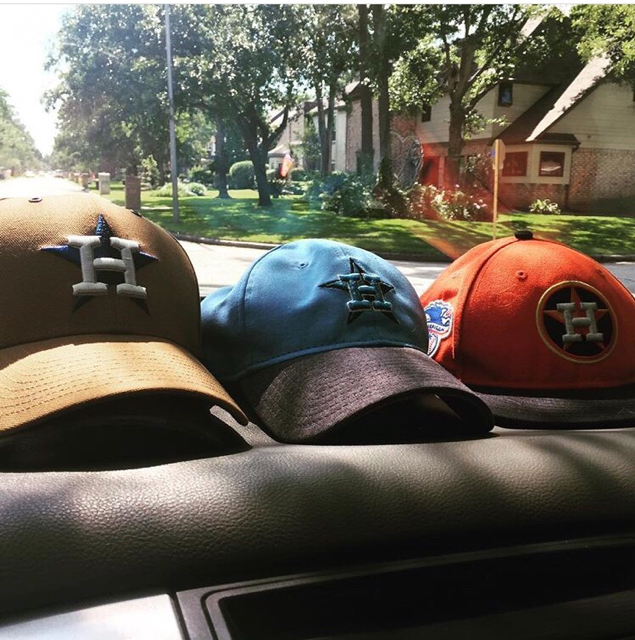 I usually have a handful of ball caps on my dash since I wear ball caps all the time. If I didn't keep them there I'd probably lose them. Never noticed it was a thing. I didn't know it was trendy. It happens in mine when I get in the truck I take it off and put it on the dash, get home and forget to grab it. Next time I leave the house I put on a different cap and repeat the process until all caps are back in the truck. Tell me about your "community use" hats. I did this for a number of years in college...registration and inspection. Yea I always have a couple on the dash. It's out of convince for me though especially on road trips where I might like to wear different ones for different occasions. Usually have a nice one that I don't want to get all sweat out and dirty and have the hat I like to work or play in. I haven't noticed the 'trend'. But, . . .
1. I really don't wear hats very often - as long as I have 12 or 13 hairs left attached to my head, I will let them breathe. 2. I hate 'stuff' being in my line of sight when driving - things dangling from the rear view mirror, on the dash, etc. - it drives me crazy and gets removed immediately. I usually have 3 or 4 up there but they are stacked on top of each other so just looks like one. One is my Dove hunting hat. Another is one of my fishing hats that has the little scarf thing that comes down over the back of the neck, and the other 2 are just extras. My son always forgets to grab a hat when we are headed out dove hunting. My guess, so they don't get smashed or sat on. I normally have 2. One mesh summer cat and one solid winter cap. I always wear a cap. I toss the cap I am wearing on the dash while I am driving. My Ford has a center spot on the dash where I keep different caps stacked together and this keeps their shape. My 2 year old boy also has to have his "deer" cap up there with mine. The tan on on the left is his for our deer lease. I am in the crowd that wears a different cap for different things. Mine are not flatbills though. Redneck version of Saggy Pants.